And it was. And then I started thinking about while I realise the movie is called Big Hero 6, and that it’s based on a comic book, and that it’s a kids version of something like a superhero supergroup like Avengers or Guardians of the Galaxy etc, there was absolutely no reason I could figure out why the hero and his loyal robot Baymax needed the other generic sidekicks by their side. They didn’t really add anything to the mix, other than occasional one-liners. They are all, I’m sorry to say, superfluous. In fact pretty much everything other than the robot is superfluous. I’m getting ahead of myself. This flick is set in a place called San Fransokyo. I know what you’re thinking, such a place doesn’t currently exist. Well, in some alternate reality, presumably the Allies didn’t win the war, and Japan at least did, so we can comfortably say that this flick is set in an America where Japan took over after World War II. All this really means is that some of the architecture of San Fran has some Japanese Shinto additions to it, and a lot of people might sound American but they’re really loyal servants of the Emperor. A brilliant but… something boy call Hiro (Ryan Potter) likes fighting robots of his own creation for money in underground fights. It’s illegal, for some reason, but clearly fun and clearly profitable, especially if you hustle people into thinking you’re just a dumb kid. Hiro has a brother called Tadashi (Daniel Henney) who is also technologically minded, who views his brother’s pursuits with disdain. Surely Hiro, a 14-year-old boy, should be at university, is what the elder brother conjectures? Why? Who knows? What kind of over-zealous in loco parentis tries to compel a 14-year-old boy into going to university? How is that kid going to grow up as anything other than a big fat Doogie Howser MD? And look how that turned out. It warps people when you push them too early. The world can’t wait, though. Hiro is a total robotics genius, and not only can’t the world wait for him to finish high school, it can’t even wait for him to finish puberty before thrusting him into a superhero adventure. Hiro, out of seemingly nowhere, invents these microbots that he can control with his mind. Look, I know he’s meant to be smart, because the movie tells us he’s smart. Still, I find it a bit convenient that he can invent a whole bunch of stuff, not only mind controllable microbots, but everything else the other characters need to play at superheroes. It also emphasises how extraneous the other characters are. Again I’m getting ahead of myself. 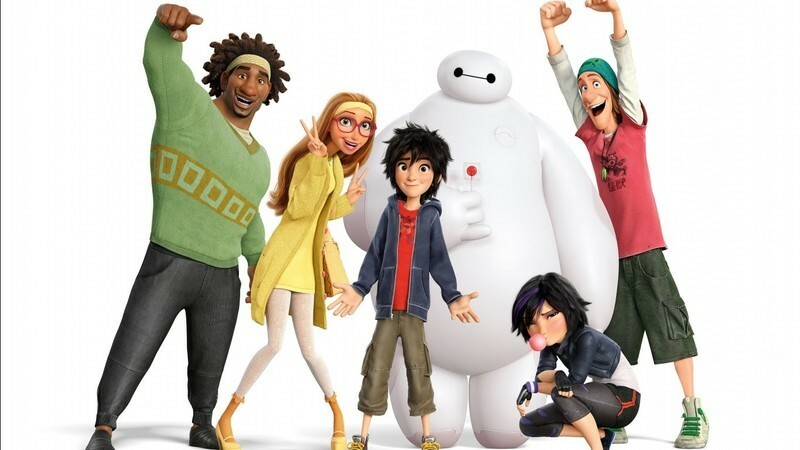 Though Hiro invents brilliant things no-one else in human history has come close to, it’s his brother Tadashi who really hits the jackpot invention-wise: he creates a robot called Baymax (Scott Adsit) who is this film’s entire raison d’être, and its most enjoyable and entertaining aspect. Tadashi envisions a legion of Baymaxes healing people across Japamerica, attending to their physical needs and looking after them in ways that Obamacare certainly never could. 90 % of the movie’s humour comes from the basic things Baymax does or says. Without him there’s no film. 100 % of the action-y stuff that matters comes from Baymax too. So why isn’t the movie called Baymax and the Other Useless Jerks? Because there is no justice in this or any other alternate reality. He’s a funny enough character. Like a long line of robot progenitors behind him, Baymax is a gentle thing programmed for niceness with none of the understanding of human foibles and intricacies that results in laugh after laugh at his expense (which is really ours). He is the innocent idiot that traipses through life without our prejudices and hangups, whose clean slate reflects back our own (occasional) awfulness. Beyond that, he’s hilarious and loyal to Hiro above all else, leading to what was for me the movie’s shining and most terrifying moment, but I’ll get to that. It was my favourite part of the movie, but not my daughter’s favourite scene. Hiro unveils his microbot creations at some kind of Science Fair the local university hosts in order to recruit new students (? ), and the world is wowed! Callaghan (James Cromwell), Tadashi’s professor, is always on the look out for promising geniuses. The demonstration is dazzling. Especially, an effete tech billionaire called Alistair Krei (Alan Tudyk) immediately tries to buy Hiro’s invention, which means it must be good. Hiro demurs when Callaghan, all paternalistic and wise, steps in and points out that Krei, who we don’t know at all, is probably evil and takes ethical shortcuts whenever he feels like it. He has a blond, Aryan look to him, and is really thin, so he must be some kind of villain. What’s a boy to do? Here’s where the chronology falls apart for me the first time in this flick: either some time after, or immediately after the tech showcase, I have no idea which one, there’s a fire at the Nerd Labs where Callaghan rules the roost, Tadashi and his friends make their inventions, and Hiro was hoping to derive meaning in his life. Tadashi races in to save his professor, and then there’s an almighty boom. Cue sad music, and lots of people consoling inconsolable Hiro. He’s understandably depressed, but on the upside, he discovers just how wonderful Baymax can be. But then, what’s this? One microbot remains, and it seems to be leading Hiro somewhere! And then a guy appears all in black wearing a Kabuki mask, using Hiro’s microbots for evil, and not good. Now, I’m not one for spoiling stuff, but as cool as the voiceless villain looks, the revelation of who they actually are and why they’re doing what they’re doing is incredibly underwhelming. Sure they’re given a motivation, but it’s ridiculous bunkum. Why Kabuki is even wearing a Kabuki mask makes no sense. Why Kabuki dude did to steal the microbots makes no sense whatsoever. Suffice to say, there was absolutely no sensible reason for the dude to do what he did: he had free and easy access to them, and clearly no restrictions restricting him from getting them or making more. But every flick needs a villain, I guess, especially ones that make no sense. The kids don’t care, only the nitpicking idiots like me cursing into their popcorn, hoping their daughters don’t hear their grumbling and griping. Where it matters is that it gives Hiro a great deal of motivation to turn to the Dark Side. Where it matters is that it gives Hiro a reason to turn his fluffy, chubby, huggable ‘friend’ Baymax into a war machine, and to transform his brother’s friends into superheroes. And then they have some fun looking adventures, and they fly around and stuff. But most importantly, it presents Hiro with the temptation to use his brother’s inventions, and his own, in order to exact revenge. And Baymax, who only ever wants to do what is ‘best’ for Hiro, his patient, is going to do it, especially if Hiro does the equivalent of deleting his ethical subroutines. I loved that bit, because for a moment, a sequence of terrifying moments, Baymax becomes something far more dangerous than the villain and his evil black Lego bricks of doom. The rest plays out how you would guess these kinds of animated action kid friendly movies will play out, with barely any digression or diversion, but that’s okay. I’ll forgive it plenty because it didn’t stick around too long, and because, above all, the relationship between Hiro and Baymax is a beautiful thing, Baymax is a delightful character, and I was happy when it ended. Seen in 3D the film looked great, but that counts for less and less these days, doesn’t it? Any flick over a budget of $150 million and more can reasonably be expected to at least look decent, even if the script was cobbled together from a program that smushes 100 other scripts together into the most generic quivering mass possible. I have no doubt there will be a sequel, though that will probably have more to do with how well the merchandise sells and how many Happy Meals are purchased. Rawr, so cynical, watch this kittens claws, eh?